Stories have always played an indispensable role in human life. Whether via oral tradition or in written form, stories provide a framework for transmitting values, heritage, culture and traditions, even for transmitting the self across spaces and generations, for keeping the self alive, as it were. Stories also enable us to acquire expectations about the world. These expectations then provide a framework for organising other pieces of incoming information. In short, without stories, we cannot process our experiences. Without stories, we do not know who we are. It is certainly true that the people of God have long known this, and even if that knowledge has at times been submerged deep in the common memory, our being and witness is grounded in story, a particular story to be sure – the very story of God – but a story nonetheless. And here comes a rub; for as Flannery O’Connor once noted, ‘there is a certain embarrassment about being a story teller in these times when stories are considered not quite as satisfying as statements and statements not quite as satisfying as statistics; but in the long run, a people is known, not by its statements or statistics, but by the stories it tells’. So tell stories we must. And, of course, the Church has a long tradition of telling and re-telling its own story. And there are radical implications for so doing, for, as Rowan Williams observes in Lost Icons, ‘Every “telling” of myself is a retelling, and the act of telling changes what can be told next time, because it is, precisely, an act, with consequences. The self lives and moves in, and only in, acts of telling – in the time taken to set out and articulate a memory, the time that is a kind of representation (always partial, always skewed) of the time my material and mental life has taken, the time that has brought me here … The process of “making” a self by constructing a story that is always being told is a prosaic and universal one’ (p. 144). There are at present two books on my desk which seek to contribute to this long tradition of helping the Church to know itself by retelling its own story. As it happens, they are both books which are accessible to children, which is particularly exciting because I’m always on the hunt for ways to tell my children, and others too in my community of faith, their own story. The first is by New Zealand writer Bartha Hill, and is called Trust God, Keep the Faith: The Story of Guido de Bres. It recounts the inspiring story of pastor and theologian Guido de Bres. De Bres was a student of both Calvin and Beza, and is best known as the author of the Belgic Confession (1561). The book paints the story of de Bres against the background of an eventful sixteenth century in Europe, events which proved to be costly for many of those who stood on the Protestant side of church reform. It can be ordered from Inheritance Publications or, if you are in New Zealand, directly from the author. For the latter, contact Bartha directly via email. 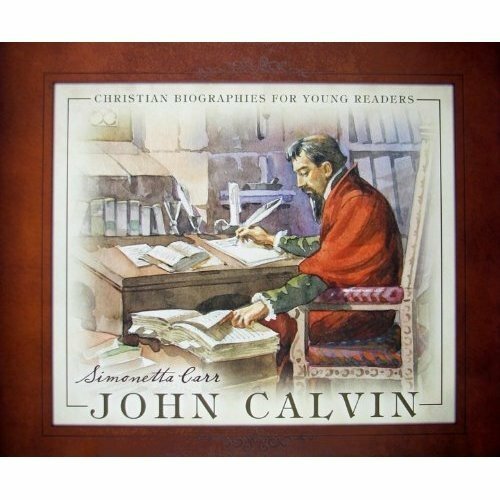 The second book is John Calvin by Simonetta Carr, and is nicely illustrated by Emanuele Taglietti. It is published by Reformation Heritage Books and is targeted at children from 6–12 years of age. Like Hill’s book on de Bres, Carr’s too wonderfully introduces readers (and their imaginations) to the narrative, humanity and rich theological contribution of its subject, and does so in a clear, readable and attractive way. The Church, and its young families, is much in need of the kind of resources that these two small volumes evidence. Both would make great gifts too. Jason, I love that quote from Williams. Thanks for sharing it. I’ll pull the book off my shelves; read around it, and sit with it.